Hollywood’s Outsider Comes In For A Chat. The Maverick Finding Neverland Star Says He’s Just A Big Kid And Confesses To A Crush On Kate Winslet! Imagination, a love of storytelling and a fascination with misfits are passions Johnny Depp and JM Barrie, the creator of Peter Pan have in common. 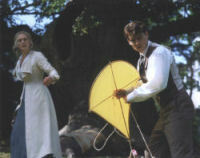 It was no surprise therefore, when Depp agreed to play the novelist in Finding Neverland.The film looks at the Scottish author’s relationship with the Llewelyn Davies family—a recently widowed mother, Sylvia, played by Kate Winslet, and her four young sons. Barrie was a hugely talented playwright and author but he was also an outsider, a man ill at ease with the often stifling social conventions of Edwardian London, who found happiness and escape playing make-believe with the Llewelyn Davies boys. That very friendship inspired him to write the classic story Peter Pan. The alienation makes Barrie a classic Depp character.The 41-year-old actor has specialized in bringing outsiders to life as in Edward Scissorhands,Ed Wood and evenDepp’s portrayal of writerHunter S. Thompson in Fear and Loathing in Las Vegas. Depp is full of praise for the four young actors who play the Llewelyn Davies boys—in particular Freddie Highmore as Peter. 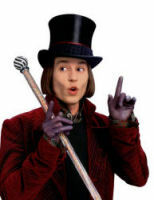 Depp was so impressed with the 12-year-old Freddie that he recommended him to Tim Burton for Charlie and the Chocolate Factory, which he is now filming. 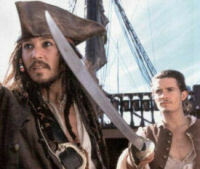 Johnny, star of Pirates of the Caribbean, lives with his partner Vanessa Paradis, with whom he has two children, Lily-Rose, five, and Jack, two. Here, he talks exclusively about being an outsider and his love and admiration for co-star Kate Winslet . . .
Did you know much about JM Barrie before you started filming? No, when the screenplay first came to me, I didn’t know anything about him apart from the speculation over his relationship with the boys. I remember hearing these stories about Barrie that were less than kind. In fact they were down right monstrous. Those boys were interviewed later in life and it was absolutely not the case that there was anything improper. Not even close. They spoke about him with such love. Considering what he gave the world, especially with Peter Pan, I thought he deserved more. If there was any way that I could brush off some of the dirt that was attached to his name then I would do it. Yeah, the kids were amazing. In terms of the story, Freddie’s character Peter had a bit more to do than the other boys but I thought the other boys held their own beautifully. And Freddie, who had the heavier load, was just amazing. He is a very gifted little guy. And you’re working with him again . . .
Yeah, we’re doing Charlie and the Chocolate Factory. You just look at him and you fall in love. Freddie is a special young man. He has a good head on his shoulders and is so great about all the hullabaloo. He is not even really sure he wants to be an actor. He loves going to school and playing with his mates. You seem to like those characters that are slightly apart from society, a little childlike . . . Yes, I think so. It’s a theme that I have returned to now and again. It’s a fascinating theme—what society deems as normal and abnormal. For the most part it was great, you know, pretty normal. I mean there were times when it was very difficult and there were rough times we had to go through as children, but compared to what a lot of kids have to go through in this world my childhood was a blessing. When you were growing up did you feel like an outsider? Oh yeah, absolutely. I felt completely and utterly confused by everything that was going on around me. It was the one thing that the teachers didn’t want you to do in school—question things. But I always wanted to know why. It really pissed them off. Presumably the great thing about acting is that it continues to let you explore? Yes, definitely. One of the best parts of this job is that it allows me to continue my education. In my research I dive into things that you become fascinated with. Like pirates for instance—you start reading about pirates and the myths that surround them. For example, no one ever walked a plank—it never happened! What kind of research did you carry out on JM Barrie? I wanted to go and visit where he was born in Scotland, near Edinburgh, but I never got a chance. I wanted to try and get a hold of some of his letters, just to look at them and spend time with them. I didn’t get that, but fortunately for me there were a few books on Barrie so I immersed myself in them. Do you think Barrie was just a big kid? Oh yeah. And not very big actually. [laughs] He was actually quite small in stature. He had less than a handful of adult friends that he could deal with on a personal level. But when he hung out with the kids, with the boys for example, he became alive. He blossomed because they were pure, they were innocent, there was no bull. They weren’t after money or social status, they just wanted to have fun and he adored that. Did he really remain their guardian, as the film states? Yes, until his death. He was Sir James Barrie but to them he was their pal Jimmy—their pal who used to run through the mud with them playing pirates and Indians. It’s beautiful. And he left the rights to Peter Pan to the Great Ormond Street Hospital in London. Presumably this is a film that your children will enjoy . . .
Yeah, my boy is two and my daughter is five. Certainly my daughter will love it and my son a little later hopefully. Was Kate Winslet a kindred spirit on this film? Oh yeah, she’s amazing. We hadn’t worked together before. She is so cool. There’s no pretence, no weirdness, no diva. She is a great girl first, a great mum—which is impressive and made me love her even more—and obviously she is a great actress. Years ago I saw Heavenly Creatures and I thought she was terrific in it—but I didn’t see the boat movie! It’s so great not to lie about someone. [laughs] Do you know what I mean? You do these things sometimes and it’s like: ‘Oh she was terrific! Next question!’ I’m happy to say that in this case I can gush on and on about Kate. Do you find the message of the boy who never grows up inspirational or tragic? I find it inspirational. Children are children for a very short period of time and all too soon the weight of the world starts throwing layers of muck on your shoulders. We lose some of the qualities we have as children, a kind of curiosity about things. We become jaded very early, especially in this day and age. I find it inspirational, the idea that it is important to try and save those things and maintain them and use it in life. Finding Neverland is out now.